Work-at-home mother of two and new owner of Knitting For Profit! Then...you're about to discover how real knitters and crocheters from around the world have made great money from their skills and knitting passion. Hi, my name is Emily and over the past 2 years I've been searching the world and interviewing successful “knitterpreneurs” - people who really do make money from their knitting and crochet. And now I've developed six proven strategies for making money from knitting and crochet based on the little-known secrets of successful knitters already living the dream of earning great money from their thriving knitting business. And if you're ready to know how to get started without needing to be an expert knitter, with no business experience, and no huge business mortgage, then this is the most important page you'll ever read! Start a SUCCESSFUL knitting business. It's a fact - 95% of people who start a small business fail within the first year. Now you can learn how to be in the successful 5% group and keep making money from your knitting business for life. Make money from your knitting even if you have no idea what to sell. If you've ever wanted to knit products that sell extremely well, but just dont know WHAT products to create or whether they will sell or not, then don't worry. Not only will this system teach you what knitted products will sell well with many, many real examples, but you'll also learn more than a dozen ways to fire up your "knitterpreneur creativity" and accelerate your ability to create knitted products that will really sell. Make money from your knitting without having knitted products of your own. When you mention making money from knitting, most people naturally assume you need to sell your own knitted products. Whilst this is often true, it is not necessarily the most profitable or easy way to make money. Did you know there are successful knitters who have learned how to use other powerful ways to generate profits without selling their own knitted products? Now you can learn these alternative strategies and secrets from their real-world experience. Make money from your knitting without making very expensive mistakes and wasting time. 97% of so called “make money from your hobby” programs are a total waste of money if you are a knitter! These programs are more often than not just re-hashed general small business guides, not specific to knitting or crochet at all. You're being misled by guides that don't really understand knitting or crochet. If you want to learn the truth about how to make money from your knitting, then read every word of this new book because it could save you thousands of your hard-earned dollars! "Who Am I And How Can I Help You?" I have been a small business entrepreneur for the last 16 years. Over this time I personally founded and successfully sold three of my own businesses. I have worked in a range of businesses and industries from manufacturing, building, hire, fitness, personal development, and fashion. Small business sales and marketing are my life – outside of raising my two children, it's all I've ever done! "Wow, this is fabulous. This is exactly what we need in this industry"
Melissa Matthay, "The Knitting Diva"
I've spent my entire working life studying business, sales and marketing. Ever since my first home based business, I wanted to know everything there was to know about success in business - I've been absolutely consumed by it. So I began studying and attending seminars. I was voracious! I bought every book on how to sell effectively, on marketing, accounting, and building a business, that I could get my hands on. I also spent thousands of dollars on seminars and tapes, CD's, on business success, marketing and sales. I would spend hours in my car listening to all my CD's. I attended expensive seminars, took copious notes and listened to every word. I Turned Myself Into a Human Guinea Pig! "I Made Some Amazing Discoveries"
The first thing I discovered from my wide business experiences is there are certain rules to sales and marketing that are essential to success in business, no matter what the product or industry. The second thing I discovered is that some business owners just never seem to get it and unless they learn and apply certain time proven techniques they are destined to failure. In fact many of these owners end up losing money and just “spinning their wheels” with ineffective businesses. In 2007 my mother-in-law introduced me to the joys of knitting – I am truly in awe of the amazing pieces she can create with yarn and two needles! But when I saw how beautiful knitted or crocheted pieces like this were selling for such pitiful amounts on E-bay and at markets, I was shocked. I decided I had to do something about it. I saw skilled knitters who had put many hours of work into their amazing creations, and after taking into account their time, effort and money spent on yarn, at these low prices there was no way they could effectively make money. I knew that with the right knowledge and good ideas, they could be getting paid double their asking price AND have people begging to buy more! From my extensive business experience I had learned the hard way that selling at such cheap prices only ends in one outcome - you make no money and eventually give up or go out backwards. Imagine making money from something you actually love doing! Because of my new found interest in knitting and my obsession with small business success I started looking at the best ways you can make money through knitting and crochet. I poured everything out of my head onto paper and began applying all I knew about business success to knitting and crocheting. Would the same great ideas and proven business success principals work as well for knitters and allow knitters from all around the world to make money from their passion? I had to find out, so I went in search of success stories – knitterpreneurs who would prove to me that it was possible. I set out to discover exactly how they did it, what specific techniques they used and what sort of success and lifestyles they lead, how did they start, and what tips did they have for beginners. Wow! Real Knitterpreneurs Making Real CA$H! Like Valerie, a stay-at-home mum who started with no experience, virtually no money and four small children. And Leah, who designs knitted garments and costumes for Hollywood stars, and Fiona who teaches people from around the world. And Diane who supplies boutique stores across America and yet her only product is so simple - scarves. Once I started looking, I found so many knitters living their dream, and making money from their passion! What were successful knitterpreneurs doing that was different from everyone else? What were the secrets to their success and could I unlock them? Could I create simple strategies that could be easily implemented by knitters? Could I show knitters how to build a full time business, or part time income? How could I share success strategies that would work for knitters worldwide, no matter what their level of business or knitting expertise - beginners or experienced? Six Success Strategies Specifically for Knitters! From this labour of love I unlocked six strategies, each of which, when used the right way, are guaranteed to help knitters and crocheters make money from their passion. Now, for the first time ever, the same strategies and techniques knitters from around the world have used to create income through their knitting, is now available to you in a single, information packed, 134 page E-book. "The Secrets of Knitting For Profit - Your Step-by-Step Guide To Success"
This is a complete knitting success manual in a downloadable E-book format, jam-packed with all the methods previously known by only a small handful of successful knitterpreneurs. This program contains my six strategies for making money from knitting (based on the techniques of real knitterpreneurs) and all the information you'll ever need to help you make money from your passion of knitting. The #1 Essential Secret to Knitting For Profit, this simple concept has made hundreds of thousands of dollars for knitters around the world! How you can live the knitters dream using my 5 Unique Knitting For Profit strategies, each one tested and proven to make money for knitters. 7 winning ideas to ensure you make money in the baby-wear market. Includes the best kinds of baby clothes you should be designing or knitting for this lucrative market. How you can slash your yarn costs in half – the secrets to buying yarn wholesale, with direct links to wholesalers around the world! How you can start Knitting For Profit today, with virtually no money and no business experience! Dozens and dozens of live links to websites that demonstrate the strategies and ideas in this book – you'll be amazed and inspired! The most effective marketing trick ever – it's cheap, easy and simple, and it will create more business for your knitting than even the most expensive advertising campaign! FREEBIES LIST – you can easily start on a shoestring budget with these comprehensive listings of amazing free online resources! You'll discover free knitting patterns, free crochet patterns, free software, free website builders, free advertising, free advice, free mentoring, free blogging, free shopping carts, free business cards and so much more! How to stand out at craft-fairs and markets, and make your stall into the cash-cow it should be! The critical elements to pricing – how much you should charge and how to make get people to pay you more! The truth about Knitting For Profit – you'll read the inspiring real stories of women who have successfully created knitting businesses. How to choose yarn that will make your products irresistible, and where you can find the most popular yarn choices from reviews of over 4,500 different yarns! How you can start selling online quickly and easily, without your own website and without any technical knowledge whatsoever! The complete rundown on selling wholesale and on consignment, plus a real knitter's consignment contract that you are free to use immediately. And believe me.... this is just the beginning! Knitting For Profit is so much more than just an "E-book" - it's a complete system for success - possibly the most comprehensive system for learning how to make money from knitting ever developed! No hype, no gimmicks - just the FACTS you need to know to make money from your knitting NOW. No Matter What Your Goals Are, You Can Start Using These Powerful Strategies RIGHT NOW To Make Money! Great question! The good news is; these strategies can be easily understood and implemented by anyone and it's not just for expert knitters. In fact we have real examples of women just like you who started with no money, no business experience,while raising small children and they've made a successful knitting business. You don't have to be an expert knitter or be business savvy to get fantastic results with these strategies. "I would have quit if it wasn't for this amazing book!" "This is an amazing book! The strategies that are described in detail in the book are great and go through the processes of getting started in an easy step-by-step manner. The amount of useful links in the book are fantastic and point you in all the right directions be it for buying yarn/wool or the little extra finishing touches to give you that professional look, or where to see what the latest fashions are for designing your own patterns. I particularly enjoyed reading the real life experiences which just goes to show that it can be done and not to give up. I had reached a point myself where I wasn't sure whether to keep going with my knitting and whether it was all worthwhile. Liz's book has done so much to reawaken my enthusiasm and to encourage me to get things started again and keep going, not to give up and achieve my goal. Thank you so much for this book Liz"
It doesn't matter what your goals are: Most of the principles are the same whether you want to just earn enough money to pay for your yarn or create a knitting empire, earn money part time or be able to leave your job and knit full time or you just want to earn some extra income for your family. "Thank you so much for all the motivating and "get your brain working" info and ideas. You are really quite marvellous and must have put so much work and effort into it all. It sounds as though it comes straight from your heart and you must have inspired and helped so many, many people." The methods most knitters are using to make money DON'T WORK - 95% of them will struggle to make any profit! If you're like most knitters and beginner business owners, the reason you're having such a hard time making money consistently is because you're using methods that couldn't possibly work, especially in these tougher economic times. If you continue with faulty business practices, it's going to get harder and harder to make money and you'll eventually get so frustrated and give up. Successful knitterpreneurs do things differently than the 95% of knitters who fail. The knitterpreneur's way to profits allows you to make money while still enjoying knitting - and that's the key to your success. Life is Way Too Short to Try And Learn This On Your Own Through Trial And Error. Why Do Things the Hard Way? Take the Short Cut to Knitting For Profit Success and Copy the EXPERTS! Why go through years of trial and error when you can - in a matter of hours - read this manual and master the knitting profit secrets known and used by knitterpreneurs around the world? This is exactly the kind of business building information I wish I'd had 16 years ago when I was just getting started! Learning even one or two of these "insider's secrets" would have short cut my success by about TEN YEARS! Maybe more. These are secrets most people NEVER discover by trying to do it on their own. These Proven Knitting For Profit Strategies..."
These are not just theories written by someone who has never been to a craft fair or tried to sell a beautifully made piece of clothing. It is written especially for you as a knitter. All the strategies, techniques examples and ideas are real and apply only to knitting and crocheting and come direct from some of the world's most successful knitterpreneurs. I have interviewed real women who started out just like you, and they've gone on to achieve their dreams. They share their stories, tips and ideas so you will not only be inspired but you'll also gain the confidence to know you can do it too. I decided the best way I could help knitters to start making money from their beautiful creations and amazing skills was to put my six Knitting For Profit strategies into a written format that was simple, complete, easy to understand and easy to apply. Now I've made it available to anyone truly dedicated to self-improvement with the sincere desire to learn. Because the E-book is downloadable, you can order it right here on this web page from anywhere in the world and get started TODAY. Thanks to technology, just minutes from now, with a couple of mouse clicks, you will be one step closer to your dream of making money from knitting! 6 FREE bonuses worth over $636.90! This ONE bonus alone may be worth the price of the entire E-Book. It's easy to see why: As part of the coaching and support you will get lots more great information and ideas on how you can make money from your knitting. If you get stuck or have a question, need motivation or some fresh ideas, you can ask me personally. I really want you to succeed, so I'll be right there to help! I don't want you to be frustrated trying to do things all alone. I remember how hard it was when I first started out. To make sure this doesn't happen to you I'm including 3 months of free email coaching so if you have any questions they will be answered by me personally. This bonus is currently FREE, but has a value of at LEAST $195, and I may begin charging for E-mail coaching at any time without prior notice. But don't worry, ORDER Knitting For Profit TODAY and your FREE 3 month E-mail coaching is GUARANTEED. Set yourself up for success right from the start! Finally! Someone developed a business plan template specifically for knitters and crotcheters. This 7 page template will help you plan your business correctly right from the start and give you a clear pathway to follow. The average person just jumps straight in without any planning at all and we all know the phrase “fail to plan, plan to fail”..
By actually spending some time to plan out your business you're GUARANTEED to get better results and start making money sooner. You will know what tasks you need to focus on and what to avoid. This is a complete business plan template specifically set up for knitters. To use it is as simple as just filling in the blanks with your ideas and goals. This template guides you along with easy to answer questions that get you thinking about your knitting business. You need to see if your sales price for each item stacks up compared to the profit levels you need to make good money - and determine your TRUE ideal selling price points. Most knitters are losing money and they don't even realize it because they're not even measuring it! The fact is, if you're only guessing at pricing (or putting on pricing that “sounds fair”), you have no way of knowing if your business is really working. And if you're losing money, it's inevitable - you're heading towards the same fate as the other 95% of small business failures. Stop guessing and start KNOWING the difference between a highly profitable product and price point, and a losing one! This simple spreadsheet program will show you how, and you can have a copy for FREE, but only if you order Knitting For Profit today. Pass up this opportunity and you'll have to pay $9.95 for this knitting pricing calculator later. As you are well aware, the wrong choice of colours can totally destroy a design. This bonus gives you access to a fantastic interactive colour tool that quickly and easily allows you to see contrasting and complimentary colour combinations. This will remove the guesswork of choosing the right yarn colours, and make your creations even more irresistible! Included are over 150 links to essential resources and free services I have found, complete with descriptions and contact details. You'll have immediate access to all the resources you will ever need to get going in your knitting business at the simple click of your mouse button, and you'll get this fantastic resource for FREE, right now if you order today. When you come on board with me, I'll be with you for the long term, continuing to find ways to make the program better, more complete, and easier to follow. If new editions of the e-book are released, you'll receive all e-book updates absolutely free. That's one of the awesome benefits of e-books. If a new edition of a hard copy book is released, you'd have to go to the bookstore or amazon.com and buy it all over again! When a new, updated edition of Knitting For Profit E-book is released, you get it for FREE! It's easy - I will contact you through my private clients email list and send you instant download instructions so you can stay totally up to date on the latest knitting for profit breakthroughs. "Worth 10-fold what I paid for!" "Hi, I started reading your book and it is very informative - then I got your bonuses on top of it. I am delighted! The information I received is worth 10-fold what I paid for!" How Much Does This Complete Program Cost? I have some great news for you! Instead of spending sometimes thousands of dollars on a general business and marketing course, you can now get all of that and more with this e-book, specifically for knitters and crocheters - AND you get it instantly (no waiting for snail mail!) Your investment in this life-changing e-book is now only $37! You get the 134 page KNITTING FOR PROFIT e-book, all six bonus's, including the FREE KNITTING FOR PROFIT updates for life - all for just $37! Don't wait another minute to order at this low price! Your valuable FREE extra bonuses will not be available for long - this program may soon only be available as part of a membership/mentoring package which will sell for hundreds of dollars. Once you place your order on Clickbank's secure server, you will be directed to the download page, where you can download your KNITTING FOR PROFIT manual and get started IMMEDIATELY. The e-book is in PDF format, which can be viewed on any computer (PC or MAC). You can read it right on your computer screen, or you can even print out your own hard-copy and put in a 3 ring binder. That's all there is to it. Once you've downloaded your book, read the entire manual from cover to cover. Then take action and start immediately! Everything is explained in plain English, which means it's easy to read and understand. And it's even guaranteed - if you don't think the information and ideas will help you make money from your knitting - I'm happy to give you all your money back, no questions asked! Look at it this way: The money you invest in this program is a drop in the bucket compared to the amount of money you would spend on yarn each year. Read the whole book. Examine the strategies. Test the ideas out. Use the system. If you're not thrilled with the information and results, then I simply want you to write and tell me, and I'll send you a prompt and courteous, no hassles, no questions asked, 100% refund. On the other hand, if Knitting For Profit helps you achieve your dream of making money from knitting, I want you to email me your success story and tell me about the results you've achieved - and tell your friends about it too! 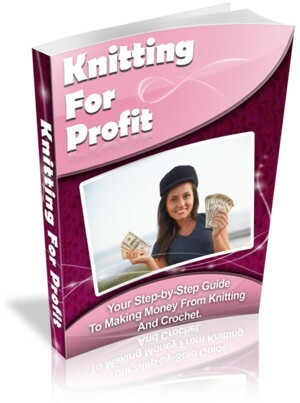 If You've Always Dreamed Of Making Money From Your Knitting And You're Ready To Do It The Right Way, THEN THIS IS IT! If you're even remotely interested in learning the truth about how to make money from your knitting, then you owe it to yourself to at least try "Knitting For Profit." If it's not for you, I'll understand. Frankly, this program isn't for everyone. Sadly 95% of people in the world are going to keep struggling and fail. But I don't think you would have read this far if you were likely to fail. Really, if you're serious about making money from your knitting it will cut years off your learning curve, save you from making very expensive mistakes, and put you on the right track from the start. I'm not looking for a huge mass of followers - I'm looking for a small handful of knitters and crocheters who want to become successful "knitterpreneurs" and who are willing to put in the effort to make their dreams a reality - people who simply need the right information, motivation and coaching to help make it happen. If you're one of those special people - one of the top 5% who are ready to make the commitment and willing to put forth the effort - then come on board with me and order today. PS The Knitting For Profit strategies can work for you if you're committed. If you're sincere about wanting to reach your goals, then don't put this off! Make a decision that could improve your life today! Right now, if you don't decide to take the first step towards making money from knitting, then this could mean the difference between earning a great income from knitting or looking back and regretting that you never gave it a go. PPS Remember, with the "no questions asked" total refund guarantee, there's no risk on your part. You have nothing to lose by at least trying my Knitting For Profit strategies, but you need to act quickly to get in on this introductory offer before the bonuses are removed, so click on the link below to order today. "Thank you for your e-book, it is great and VERY thorough. It is not only well written, but valuable, needed information for anyone wanting to Knit for Profit." Sharon Nani of "The Knit Tree"
PLEASE NOTE: Knitting For Profit is a downloadable e-book. No physical products will be shipped. After you order, you will get INSTANT ACCESS to download the e-book and all the bonus reports onto your computer. The e-book format is adobe acrobat PDF, which can be viewed on Mac or PC. Note: ClickBank sells our products - they are a secure trusted online retailer specializing in digitally delivered products. They use the strongest security features available on the internet and never store your financial data on their system. Your credit card data is passed directly to the bank and no-one but the bank has access to your information. They are also approved by the Better Business Bureau.